How did I end up climbing Buck for the second time in a week? 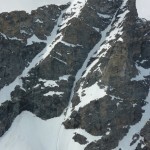 Last year I noticed the two parallel couloirs on its north face, but did not get around to climbing them. With freezing overnight temperatures up high for a couple of nights, these snow/ice routes are actually climbable now, while they might not be after things warm up on Thursday. One reason I skipped these routes last year was that the east couloir has a sketchy 5.4 slab entry, while the west has a 5.7 rock exit. Another is that the normal approach is a bushwhack up the south fork of Avalanche Canyon. 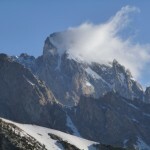 However, one of the Jenny Lake climbing rangers suggested an alternative approach up Stewart Draw, and it seemed like the right time to give one a shot. 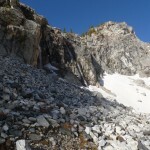 It turns out that the entry to the east couloir looks every bit as sketchy as I had heard, but the “5.7” rock above the west couloir is both short and much easier than 5.7. After crawling out of bed at 4:00, I was on the Death Canyon trail by 4:45, putting in about 20 minutes’ headlamp time. Things had melted out some since last time, but the remaining snow was pleasantly firm. Below Timberline Lake, I headed north to the ridge, to see what things looked like going into Avalanche Canyon. Being lazy, I chose the lower, eastern chute, and was promptly punished by cliffing out. I eventually made my way farther east, and managed to descend a mixture of wet and icy slabs, grass, and forest to the canyon floor. Regaining my lost elevation, I saw that the higher gully (immediately east of the cliff band above Timberline Lake) would have gone easily. 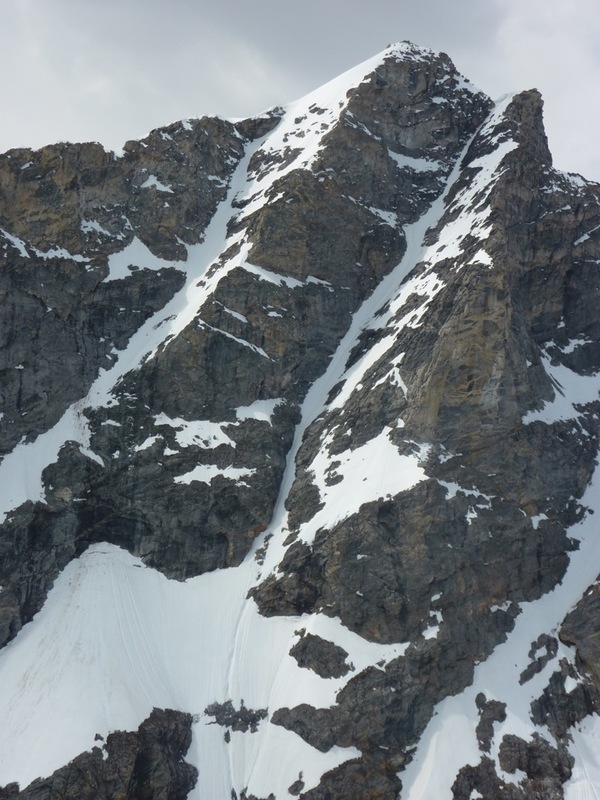 Passing the correct chute, I aimed for the broad shelf at the base of the two couloirs, grinding up and right across a long, steep snow slope. 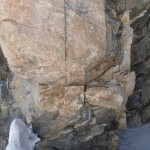 The couloir entries were both obvious: the left/east couloir is separated from the shelf by some wet, icy, and generally sketchy-looking slabs and ledges; the right/west couloir starts directly from the shelf in a right-facing corner. Hoping I wouldn’t be forced to retreat by the reported “overhanging 5.7 rock” at the top, I took out my other tool and got to work. 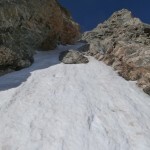 The couloir, still shaded, was in excellent condition, with a few patches of ice and acres of steep, perfect styrofoam. It is consistently steep, but the snow was soft enough that I could kick a step to rest when my calves tired from front-pointing. Though there was no major rock- or ice-fall, tiny pellets of ice would intermittently rain down from somewhere, almost making me wish I had brought a helmet. With a final 10-foot slush-wallow, I topped out in a notch on Buck’s west ridge, and was immediately confronted by the rock obstruction. 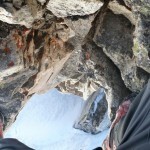 While it was steep, it was also full of huge positive holds for hands and slots for dry-tooling. Using one hand and one tool, I made short work of it, then cruised another 50 yards of class 3 to the summit. 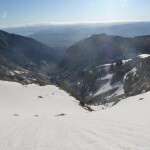 After enjoying the view, I plunge-stepped and boot-skied down the east face, and was back at the ranch for lunch. This is an excellent climb, well worth doing if you have the skills. 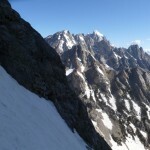 The Stewart Draw approach is bushwhack-free, the couloir is consistently steep, the rock step at the top is maybe 5.5 at the most, and the descent is quick and easy. 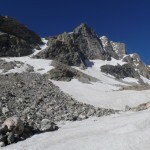 With the right conditions, it may even turn into an excellent moderate alpine ice climb. 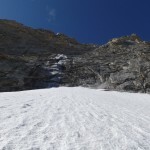 Damn–what a great climb! 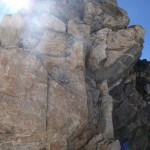 I was psyched to do this route on Thursday, but failed to interest anyone else. Mitch, Brian and I got a good look at it from Wister, though, and I thought it looked good. Your confirmation puts it near the top of my list for next year. Kudos for a fine day’s work! Thanks! 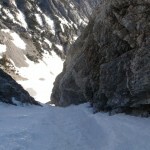 It’s a great route and, done right, the approach from Stewart Draw is much less painful than Avalanche Canyon. I was surprised how easy the rock step was for a supposed 5.7.